Swiss Foreign Minister says UN's agency for "Palestinian refugees" is ammunition to continue the conflict. UNRWA, the UN agency for “Palestinian refugees” is fuelling "unrealistic" hopes of return after 70 years of exodus and is therefore helping keep the Mideast conflict alive, Switzerland's foreign minister said Thursday, according to AFP. UNRWA was established after the War of Independence in 1948, when around 700,000 Palestinian Arabs fled from their homes. 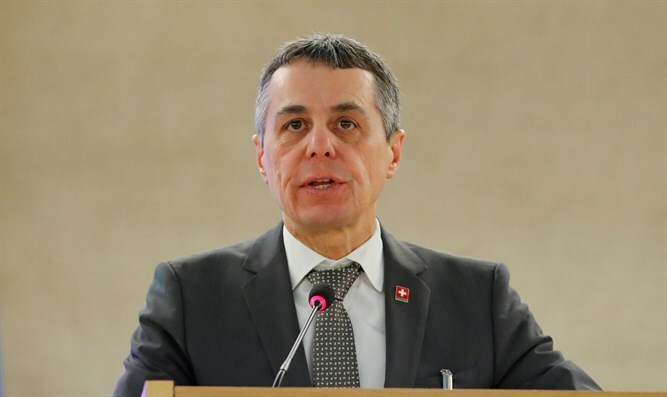 But Swiss Foreign Minister Ignazio Cassis pointed out that the number of so-called “Palestinian refugees” living in Lebanon, Jordan, Syria, Palestinian Authority-assigned areas of Judea and Samaria and Gaza has swelled to more than five million. "It is unrealistic that this dream (of return) will be fulfilled for all," he said in an interview given to several German-language papers. "But UNRWA maintains this hope. For me, the question is whether UNRWA is part of the solution or part of the problem," he said, concluding that "it is both". The UN agency, he said, "worked as a solution for a long time, but today it has become part of the problem." "It provides ammunition to continue the conflict. For as long as Palestinians live in refugee camps, they will want to return to their homeland," opined Cassis, who added, "By supporting UNRWA, we are keeping the conflict alive." At the same time, Cassis warned that the sudden funding cut facing the agency posed "a big risk". "Millions of Palestinians could take to the streets," he said, cautioning that lacking funds could cause the breakdown of a "machinery that provides stability". "This is a risk that Switzerland cannot afford," he added, noting that his country would continue funding UNRWA, but he also called for a heavier focus on integrating “Palestinian refugees” into their host communities. It later received pledges of $100 million in additional funding from Qatar, Canada, Switzerland, Turkey, New Zealand, Norway, Korea, Mexico, Slovakia, India and France as a means of making up for the aid that was cut by Washington. UNRWA's representative in New York has warned that the organization is facing an "existential financial crisis" following the U.S. cut. A video released on Thursday by the Center for Near East Policy Research at an UNRWA school and refugee camp in Gaza allegedly shows that UNRWA encourages anti-Semitism and the realization of the “right of return” through violent means. UNRWA reportedly closed its schools in Gaza on Monday and Tuesday, allowing students to participate in the riots at the Gaza border. At least 40,000 people participated in the riots, in which at least 60 people were killed. The majority of those killed were confirmed to be members of Hamas by the terrorist organization itself.